There is no information available on the climate in Gansu Province. As described Ningxia is a sparsely populated Region where most of the population can be found in the fertile Northern Plain of the Yellow River. Traditionally the most important railroad in neighboring Ningxia Hui Autonomous Region is the so-called Baotou-Lanzhou. This railroad connects the City of Baotou in Inner-Mongolia (AR) with Lanzou in Gansu Province and is traditionally a vital logistics artery. Ethnic Minorities in Gansu Province are the Tibetans, the Salar, the Dongxiang, the Tu, the Bonan and the Yugurs (not Uygurs!) . Mongolians may also be found in Gansu Province, as they live throughout the entire North of China. The Hui are well represented in Lanzhou, the Capital City, where they are as usual traditionally engaged in trade and commerce. Perhaps the first and most visited and traveled landmark of Gansu Province is The Great Wall of China. Gansu is one of the North-Western Provinces of China. Its topographical borders are mainly determined by natural features of the landscape. In the North lies the Gobi Desert, which stretches both East- and Westward. In the West between Yinchuan the Capital of Ningxia and the Shanxi Province Border of the Yellow River lies the Ordos Desert. In the East lies Qinghai Province and the Eastern Half of the Tibet-Qinghai Plateaux with its lush grasslands, green valleys but also steep snow-capped mountains and dangerous passes. Only the South and the South-East directions open up into greener lands of Sichuan Province and Shaanxi Province. The strategic Hexi Corridor, also dubbed "the Throat of China" extends north-westward into the Gobi Desert between the High Mountain Ridges of Qilian Shan and the Mountains of Nan Shan in the South. In the Far West Gansu Province Ends just short of the marshes of Lop Nor, part of Xinjiang-Uygur Autonomous Region. attack route into Han Territories. First completely conquered, pacified and integrated as "Western Territory" during the Han Dynasty (206 BC - 220 AD), the military success of the conquering of Gansu Province from Nomadic Tribes layed the foundation of the grandiose success of the Han Dynasty and the first opening of a Silk Road. Gansu today includes the Yellow River and the Hexi Corridor and the Chinese Stretch of the Silk Road. Clock-wise around Gansu Province is thus bordered by in the North and North-East by Inner Mongolia AR and small Ningxia Hui Autonomous Region at the Yellow River. Due East lies Shaanxi Province, to the South lies Sichuan Province and due West lies Qinghai Province, the East Section of the Qinghai-Tibet Plateux also known as the "Roof of the World". Overview Map 2 - Schematic Map of Gansu Province and surrounding area's. Click for Full Sized Version. 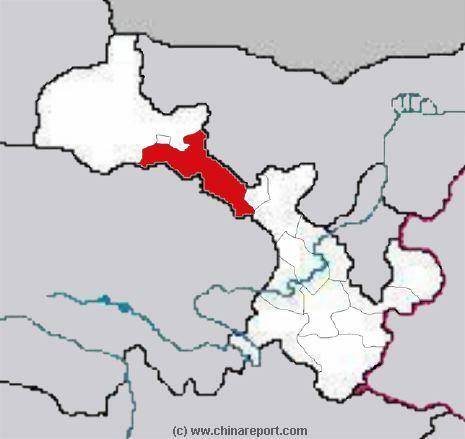 The main inhabited part of Gansu Province is the South-East which includes the Capital of Lanzhou, the City of XiaHe (with its Labrang Monastery), Linxia, Longxi, Qinan, Tianshui and Jingyuan dispersed over various districts of the Province. The South-East of Gansu Province lies due West and South of Inner Mongolia Autonomous Region and at the end of the Gobi Desert. The Capital of Lanzhou lies at the Center of a Transitional Zone where the dried and sparsely inhabited parches of the Gobi Desert meet the Loess Lands of the Yellow River Basin. To the South of Lanzhou the landscape turns greener and more mountainous. 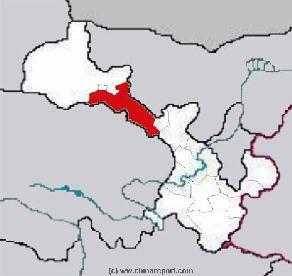 Schematic Depiction Gansu Province and Districts. 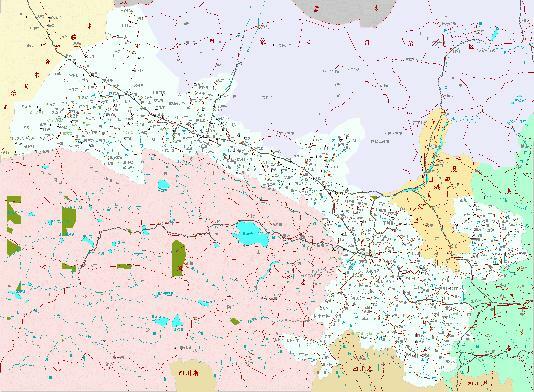 This Map conveniently depicts the 3 zones of Topography and Climate : The green and wet south, the arid central section of the Hexi Corridor and the Desert West with Dunhuang Oasis. 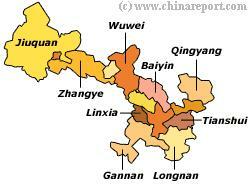 Topography Gansu Province can be divided into 3 zones which vary remarkably and have their own according Climates. The South Part of the Province has the lowest altitude and the warmest and wettest climates. A large Green Zone extends South from Tianshui into Sichuan Province and East into Shaanxi Province and beyond to Henan. The middle section of Gansu Province, or the "throat of China" is formed by a high plateaux running down from the High North near Lop Nur and Dunhuang, wedging between two mountain ridges and bending around the Heights of the Qinghai Plateaux to descend down and end at Lanzhou. This section is dry and arid and often windy, and consist of barren graveled lands and salt lakes. 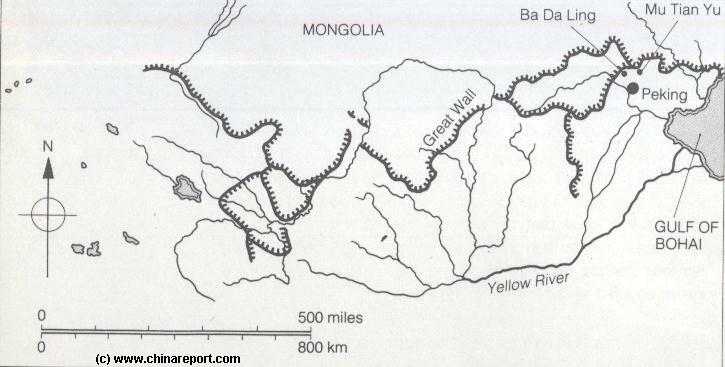 Rivers, formed by melting waters from nearby mountains cut across the plain, but waters rapidly flow downstream to end up in the Yellow River near Lanzhou. The Last and Third Zone is found in the Far West where for centuries and ages the small City of Dunhuang, the "Blazing Beacon", forms the last Oasis and Bastion of Civilization in an otherwise bleak desert-like Landscape. In the West the gravel is met by the ever shifting Sands of the Taklamakan Desert creating a mix of fast rivers, small oasis, high sand dunes and flat wastelands. Sand storms are frequent here, especially in the spring months. In Summer Temperatures soar to staggering and unhealthy heights. If you intend to travel these parts on your own account, come well prepared, or else become the "Pisang" (Roasted Banana). The climate here is pure desert, harsh day and night during most of the year and often potentially lethal. Some count a 4Th Climatic Zone in Gansu Province, namely the alpine like grasslands of the South-West leading into Qinghai Province. The Capital of Gansu Province is the City of Lanzhou, since before recorded history a settlement on a convenient crossing point on the wild and often untamed Yellow River. Lanzhou Today is a foul aired industrial city of millions , a true capital of remarkable highrises with the 2.8 million population stacked and concentrated along the narrow river banks at the bottom of the Yellow River Gorge cut by the River in the Loess Plateaux that sets the main landscape and scenery here. Except for the everflowing Yellow River with its magnificent bridges and the Gansu Provincial Museum, Lanzhou City itself has few sights to offer and even fewer remaining historic landmarks. There is a Yuan Dynasty Era Temple and Dagoba on the Hilltop overlooking City and River, a modern day Mosque for the Hui Islamic Minority, the Qing Dynasty White Cloud Temple and little else. A New Modern City Square has just emerged. In the surrounding and outlying area's of the Province there is plenty to see. The air quality is remarkably better as well. First and Foremost, travel from Lanzhou to nearby Yongjing to catch an hour long boat ride up the LiuJiaXia Reservoir of the Yellow River here to BingLing Si. The Buddhist Statues, Murals and Caves of BinLing Si are a world cultural heritage site and relic of the Han & Tang Dynasty Era Silk Road. More such Caves and Statues can be found in- and around Gansu Province but the BingLing Caves are so far among the most famous and well-known. The next choice is difficult, so our listing continues with an overview of the South Part of Gansu Province, the area in a wide circle around Lanzhou. In counter-clockwise direction here we further find small XiaHe with it's impressive Labrang Lamasery. The Labrang Monastery is 2nd among the 3 most famed and hallowed Monasteries of Tibetan-Lamaist Buddhism and is another worthwhile place to have a look around. Main Cities. Great Wall. Silk Road. The Yellow River (Huang He), China's second longest River, The Hei He or Black River (Ejin Gol in Inner-Mongolia Autonomous Region), the Taolai River near Jiayuguan. 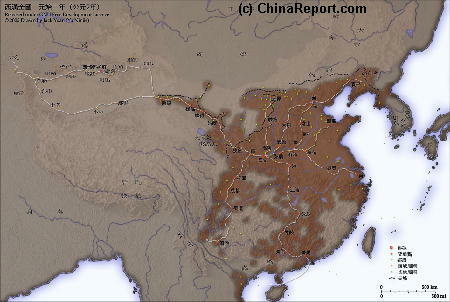 In the 13Th Century the large extenses of Gansu Provinces Hexi corridor and the pathways of the Silk Road served as the conduit for Marco Polo to travel into China. By the Time of the Qianlong Emperor of the Ching Dynasty the Shanxi Merchants and their various monopolies had made Shanxi Province the wealthiest province of the prospering nation, with more cash silver teals than the Imperial Coffers. Shanxi Businessmen controlled trading as far as Dunhuang in far Western Gansu Province, Xinjiang and well into area's now part of the Capital of the Republic of Mongolia. In the wake of their trade Chinese Han Culture, new technologies and Shanxi's Influence followed. In 2007 north-western Gansu saw the forcible relocation of hundreds of thousands of Tibetan herders. No doubt the second important reason to travel to Gansu is the ancient Silk Road, which is not a landmark but rather a whole series of landmarks connected by ancient trading paths and the tales of heroes of yesteryear. Gansu Province offers a wide variety of tourist sites to visit. From the ancient monuments of the Silk Road, to the The Great Wall of China and many other sites. On top of that, Gansu Province with its three distinctly different climate zones offers a stunning variety of natural landscapes and sceneries.